Victory Cruises has ended their sailings to Cuba for now. They have fabulous sailings to French Canada and the Great Lakes! Contact us for more information and pricing! Victory is known for its luxury service with almost a 2 to 1 Guest to staff ratio. 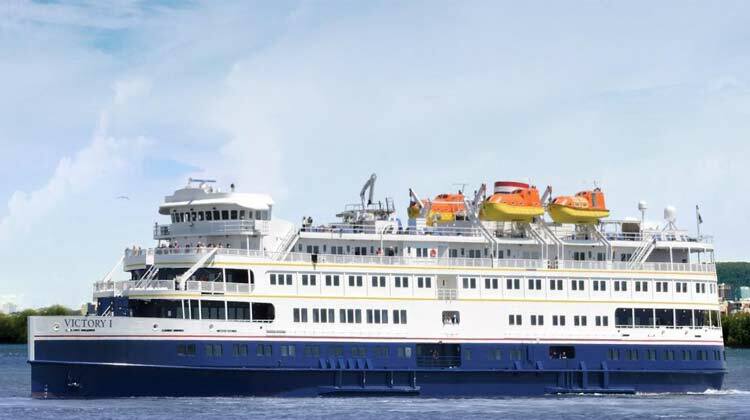 The M/V Victory 1 was completely refurbished in 2015 and relaunched in 2016. Elegance, fine dining, personal service, and on-board enrichment is what defines this cruise line. CALL NOW FOR PRICING AND TO JOIN US ON BOARD VICTORY CRUISES! Be the First to Sail on a Cruise to Cuba! Call us now to book or for more information. (855) 586-2822 Or Click Here to fill out our form to be on the Top of the List!! Cruising To Cuba is currently taking reservations for ALL Holland America, Norwegian, Royal Caribbean, Azamara, Oceania, Viking, Regent, Victory and Pearl Seas Sailings to Cuba. Please fill out a booking form right away to be included on one of these magnificent sailings! Cabin availability is going fast. Pricing may change until time of deposit.